Meet And Greet Assistance At Indira Gandhi Int. Airport, Delhi And Transfer To Hotel. Delhi- Delhi Is A City That Bridges Two Different Worlds. Old Delhi, Once The Capital Of Islamic India, Is A Labyrinth Of Narrow Lanes Lined With Crumbling Havelis And Formidable Mosques. In Contrast, The Imperial City Of New Delhi Created By The British Raj Is Composed Of Spacious, Tree-Lined Avenues And Imposing Government Buildings. Delhi Has Been The Seat Of Power For Several Rulers And Many Empires For About A Millennium. Many A Times The City Was Built, Destroyed And Then Rebuilt Here. Interestingly, A Number Of Delhi'S Rulers Played A Dual Role, First As Destroyers And Then As Creators. Breakfast At Hotel And Transfer To Igi Airport To Connect Flight For Bagdogra. Lunch At Bagdogra. Later Drive To Katihar. On Arrival Katihar Transfer To Hotel. Dinner And Overnight Stay At Hotel. After Breakfast Visit To Bank Of The Ganges And Boat Ride. Day At Leisure And Personal Activity. Lunch, Dinner And Overnight Stay At Hotel. After Breakfast At Hotel Visit To Vikramshila. Lunch At Vikarmshila. The Seven Point Mind Training By Acharya Shrigyan Dipankar. Evening Return Back To Katihar. Dinner And Overnight Stay At Hotel. Breakfast At Hotel And Drive To Bodhgaya. Lunch On The Way. On Arrival At Bodhgaya, Transfer To Hotel. Dinner And Overnight Stay At Hotel. After Breakfast Visit To Mahabodhi Temple: The Maha Bodhi Temple Is An Important Place Of Worship For Buddhist Followers. The 170 Ft High Slender Pyramidal Spire Of The Temple Gives It A Magnificent Look And Within The Temple There Is Gilded Image Of Buddha In A Sitting Posture Touching The Earth With Is Right Hand. Griddhakuta Or Vultures Peak: Buddha Used To Spend Monsoon Months For Three Years Here, Meditating And Preaching. The Buddha Sangh Of Japan Has Made A Massive Stupa Called Shanti Stupa On The Top Of The Hill Here. A Ropeway Is Built To Reach To The Top. Feet In Circumference & 27 Feet In Height. Dhamekh Stupa: Sarnath : Sarnath Is The Deer Park Where Gautama Buddha First Taught The Dharma, And Where The Buddhist Sangha Came Into Existence Through The Enlightenment Of Kondanna. 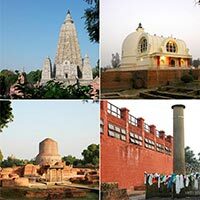 Sarnath Is Located 13 Kilometers North-East Of Varanasi, In Uttar Pradesh, India And Various Temples. Sarnath Museum: Sarnath Yielded A Rich Collection Of Sculptures Comprising Numerous Buddha And Bodhisattva Images. Considerde Amongst The Finest Specimens Of Buddhist Art, These Have Been Housed At The Museum, Adjiacent To The Site. The Museum Is Open From 10 Am To 5 Pm, And Closed On Fridays. Apart From The Above The Other Objects Of Lnterest At Sarnath Are The Dharmrajika Stup, Magnificent Lion Capital, India’S National Emblem At Sarnath Museum, The Saddharmachakra Vihar’S At Excavated Ruins. Morning Enjoy Boat Ride In The Holy River The Ganges. Breakfast And Lunch At Hotel. After Lunch Drive To Kushinagar. In The State Of Uttar Pradesh, 52 Km From Horakhput In Northern India. Kushinagar Is One Of The Four Major Pilgrimage Destinations Said To Have Been Authorized By The Buddha Himself. 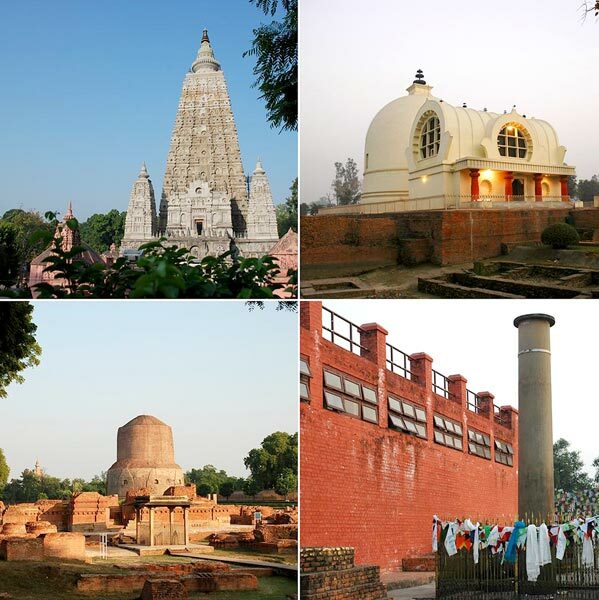 The Other Three Sites Are: Lumbini (Birth);Bodhgaya (Enlightenment); And Sarnath (First Teaching). Lumbini : Lumbini Is A Buddhist Pilgrimage Site In The Rupandehi District Of Nepal,. It Is The Place Where Queen Mayadevi Gave Birth To Siddhartha Gautama, Who As The Buddha Gautama Founded The Buddhist Tradition. Buddha Was Also Found Here, Which Is Now Housed In The Kolkata Museum. Hall Is Believed To Be The Largest Vaulted Chamber In The World. After Breakfast Visit To World Heritage Monument The Taj Mahal. Taj Mahal Means Crown Palace And Is In Fact The Most Well Preserved And Architecturally Beautiful Tomb In The World. The Beautiful Taj Mahalwas Built By The Fifth Mughal Emperor, Shah Jahan In The Memory Of His Beloved Wife Mumtaz Mahal. The Construction Work Began In 1631 With More Than 20,000 Workers And Artisans And Was Completed In 22 Years. The Iranian Architect Istad Usa Made The Design And The Marbles And Other Materials Were Brought In From All Over India And From Central Asia. Morning Breakfast At Hotel And Visit To Qutab Minar : Built In 1199 A.D. By Qutb-U'D-Din Aibak, Marking The Victory Of Mohammed Ghori, The Invader From Afghanistan, Over The Rajputs. The Victory Tower Is 72.5M (238 Ft) Tall, Built Of Red Sandstone With Calligraphies Representing The Verses Of Koran. To Reach The Top One Has To Climb 379 Steps. The Base Diameter Is 14.3 Mts While The Top Just Measures 2.7 Mts In Diameter. It Stands Outside The Courtyard Of Quwwatul Masjid And Was Used As A Minar For Calling The Faithful To Prayer. Also Visit To Lotus Temple, India Gate, Raj Ghat, Rashtrapati Bhawan, Parliament House. Lunch And Dinner At Chinese/City Restaurant. Evening Timely Transfer To Igi International Airport For Connect Flight For Onward Journey.